The water cooler special use of refrigeration machines. It is used to cool water "on tap", drinking fountain. Ordinary sealed (sealed) refrigeration system is used. Refrigerant control of the capillary tube. Scheme of drinking water supply system is shown in Fig. 3-15. The liquid refrigerant flows from the bottom of the condenser liquid line. It flows through the filter-drier (dark red) and in the capillary tube. As he enters the evaporator, it evaporates and absorbs heat from the surface of the evaporator (light blue). Evaporator or near surrounds drinking water coil or water cooling tank. The evaporator, the refrigerant vapor goes into the battery in the suction line. The battery stops any liquid refrigerant from flowing into the suction line and/or the motor-compressor. Battery, steam is drawn into the compressor motor, where it is pumped to the condenser (red light). It is warm, took in the evaporator released. Meanwhile, the refrigerant is returned in liquid and collected at the bottom of the condenser. Hence, the cycle repeats. As the demand for dri irking fountain is very irregular, it must have some believe-over capacity. It need not SuperCool water. 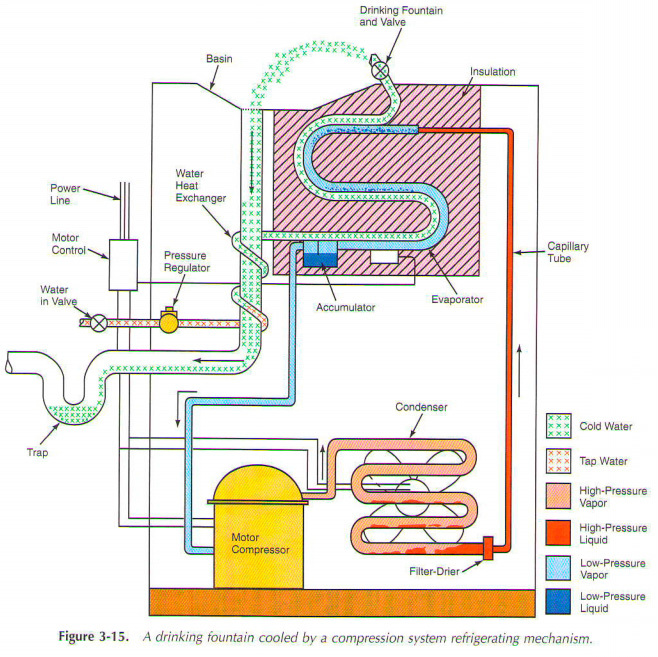 Capacity building through insulated tank or large surface cooling in the evaporator.